Eight student journalists have been selected to serve as partners for 45words, a student-run journalism organization dedicated to promoting student First Amendment rights. 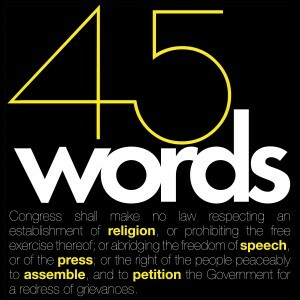 45words is named for the 45 words in the First Amendment, which grants five basic freedoms to all U.S. citizens. This student-run organization’s mission is to support free speech for students, to encourage First Amendment awareness, to connect with student journalists across the country and to help students fight censorship. Created by the Journalism Education Association’s Scholastic Press Rights Committee, 45words has student partners from across the United States representing schools from California, Texas, Missouri, Virginia, Pennsylvania, Indiana and Florida. Jake Chiarelli, a senior, is the editor-in-chief of digital media at Francis Howell North High School in St. Charles, Missourri. Jake manages FHNtoday.com, an award-winning news website and assists in production of FHNgameday.com, a high school sports website, and FHNtodayTV, a monthly news podcast. This is Jake’s fourth year on the FHN Media staff. Luke Haag is a junior at North Central High School in Indianapolis, Indiana. He is the first junior to become editor-in-chief of the school’s yearbook, The Northerner. This is Luke’s second year on staff. Lia Hagen is a senior at Westside High School in Omaha, Nebraska. She is editor-in-chief of Craze, the school’s online magazine, and copy editor of the school newspaper, The Lance. After high school, Hagen plans to pursue a career in journalism. Courtney Harper is a junior at Rocklin (California) High School, home of the Thunder. She is a part-time Web editor for the school’s magazine, The Flash. This is her third year with the program and her second year being officially a part of The Flash staff. Michael Hong is a junior at Conestoga High School in Berwyn, Pennsylvania. Michael is the news editor of The Spoke. This is Michael’s second year on the staff. Sriya Ravi is a senior at Carmel (Indiana) High School. She is the Perspectives editor of the HiLite and a reporter of the Acumen. This is Sriya’s third year on the HiLite staff. Kelsey Vita is a junior at Rockbridge County High School in Lexington, Virginia. She is the web editor of The Prowler, which launched its site in October 2014. This is her second year on the staff. Returning partner Suproteem Sarkar is a senior at Conestoga High School in Berwyn, Pennsylvania. Sarkar is an editor-in-chief of The Spoke and is a NSPA finalist for Diversity Story of the Year. Sarkar also represented Pennsylvania in the Al Neuharth Free Spirit and Journalism Conference in Washington, D.C., this past summer. These secondary school students were selected from applicants nationwide. Their mission is to promote First Amendment awareness by opening dialogue with other students around the country via social media and at local and national student media conventions. They can be followed on Twitter at http://twitter.com/45words; the Facebook group is 45words.